If Instagram is a part of your social media marketing strategy (and it should be) you know that their algorithm has made it that much harder to grow your following. You have to be strategic about your efforts to create a successful account. With that being said, there are definitely ways to get the engagement levels you want. Here are 5 ways to help you boost engagement on Instagram. The first rule of using social media marketing is to engage as much as possible with your followers, though many brands do not. 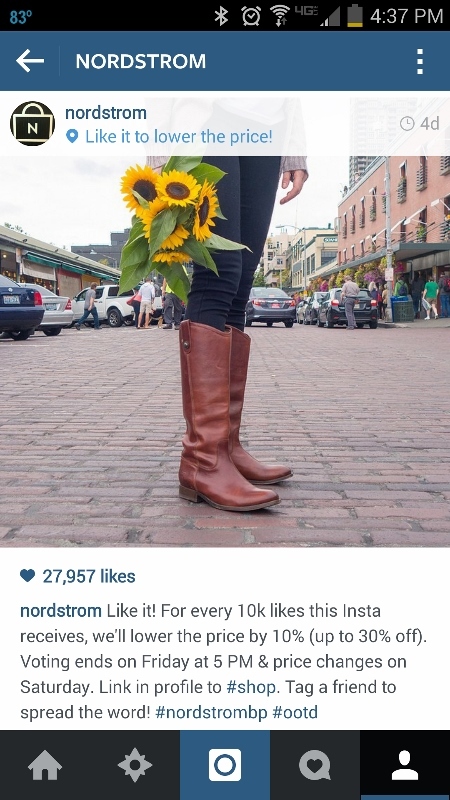 Whenever you share a new post on Instagram, make sure you are ready to engage with any responses. Aside from responding to questions in the comment section, you can use Instagram Stories to address a question or you can create a new post addressing it. In addition to responding to your audience, you should come up with topics to help boost engagement. Contests, quotes, polls, questions. See what sparks interest among your audience and follow where the feedback takes you. Social media marketing is all about boosting reach so make sure to take advantage of all the ways you can help extend it. As an example, you can set up your Facebook page with a clickable link that will take people directly to your Instagram profile. The same goes for Instagram, you can post from here to Facebook and other social media platforms. By doing this, you can help join your fans together while directing them to your Instagram profile. There are also features within Instagram that can help with cross promotion. You can use Stories to let people know about new posts you uploaded and vice versa. Just be sure not to cross promote every post. Be strategic. Show your followers you appreciate them by doing an Instagram giveaway. Choose some products or services to highlight while you are encouraging follower engagement and showing them that you value them. 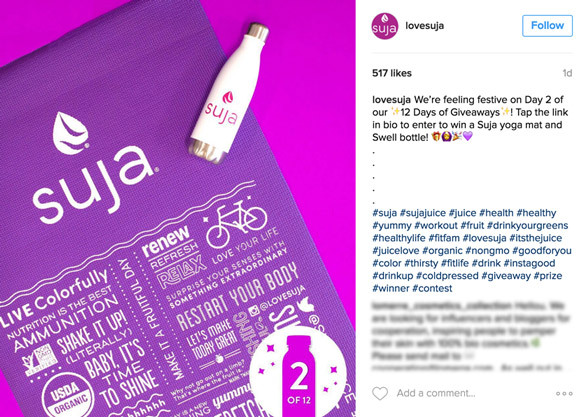 Suja juices shows some appreciation for their loyal fans by giving away a yoga mat and Swell bottle. If you want your giveaway to be successful, you need to carry it out properly. Make sure you announce your giveaway everywhere you can. In your posts, ads, stories, as well as on your other platforms. You want to have a clear CTA (call to action) that comes across with a sense of urgency. When it comes to the prize you choose, make sure it is not only exciting but relevant and of value to your audience. Linking the prize to a theme or event can be something fun to try. It is crucial to include a simple call to action in your post captions. This can be posing a question and asking your audience to comment or you can direct them to a link in your bio. This helps encourage followers to engage with your content and spend more time on your post. Bonus Tip: Put your CTA at the beginning of your caption since Instagram hides some of the text when you post. Here is a great example from Nordstrom. Every brand wants to maximize their advertising budget and not spend too much money, but it pays to look into Instagram ads. Their algorithm has been updated to prioritize this service. You don’t have to spend tons of your marketing dollars to make sure you are presenting your product/service to the right audience. Before you start throwing dollars towards ads, make sure you know exactly who your target audience is, where they are located and what their interests are. This will help ensure you are not just throwing something out there and hoping it sticks. Having a successful Instagram account for your brand is much more than just getting lots of likes and followers. As we move into 2019, Instagram continues to grow in popularity and there is a ton of competition out there. You need to put your focus on building up engagement in order to maintain visibility. The above tips will help you foster a more genuine relationship with your followers which leads to stronger brand loyalty and ultimately, increased revenue.